These Upcycled Picks are made from Recycled Materials such as Gift Cards that are Expired, Invalid, or Not Activated. Designs will vary, and Gauges are all a Medium (about .60-.75mm). 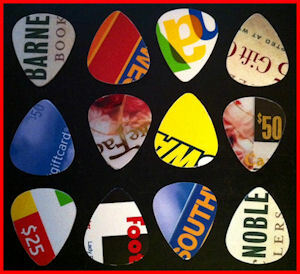 A great way to grab some extra picks, and do something great for the environment. They are available in packs of 12 Picks.